Hey bros got an NC - Miata Turbo Forum - Boost cars, acquire cats. 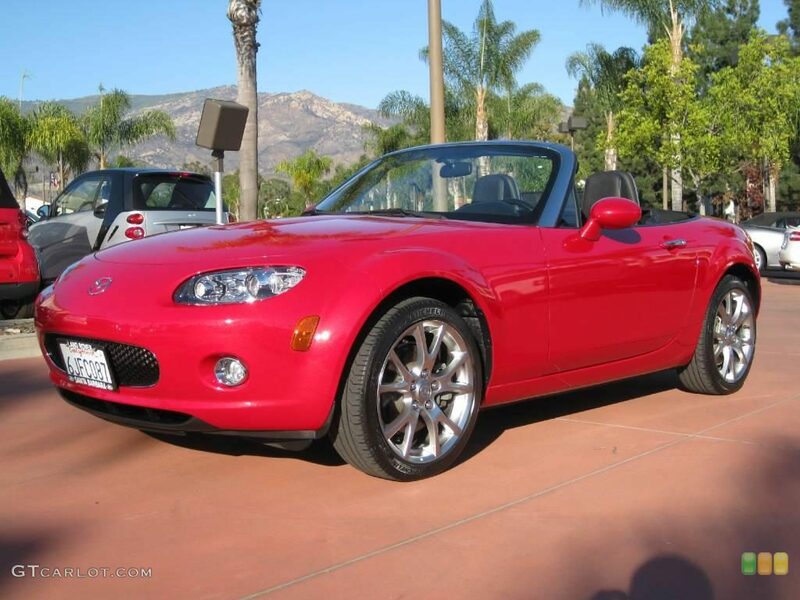 I finally bit the bullet and bought an NC. I test drove one a few months ago and loved it, and I just found a great deal on craigslist and went for it. Its a 2006 Limited Edition grand touring with 80k miles. Has 6spd, leather, torsen, bilstein, bose etc. It is a huge improvement as a daily driver. It will be turboed eventually, but thats at minimum a semester away. I'm thinking gtx2871 because I may have found a hookup at garrett, and IDK if a EFR will fit as nicely as in the NA/NB. Anyways, I attached a pic of the same color but different car. It's really sparkly red with some chrome accents and black top. Installed a Grom Iphone/Ipod cable today as well as a redesigned center console from Goodwin racing. The Iphone cable works very well, only flaw was that it had like 6 feet of cable which was a little tough to route under the center console. The center console gives a ton more room, but the fit and finish has a little room for improvement. I may try to modify it to fit better eventually. All in all, I'm glad to finally have great audio input quality (had to fix broken cd player as well) and the NC center console is a lot trickier to get off than the NA console! Nice. Looks like a nice pick up. ^^the brown/tan seats in nc miatas is a beautiful color. I came really close to purchasing one but the expensive aftermarket pushed me away. Update: ohlins have been purchased and are in my possession, install should be next weekend. Planning turbo install for the summer. Hoping to fit an efr in, and going to have some sweet electronics all routed into a little unit called a dashdaq for all of my gauges and data logging. Wheels tires and sways will come after ohlins install but before turbo. Also going to dynamat the doors and floors. I'm excited for 2013, the year of the nc! How do you like it so far? I'm looking for something a little newer feeling, and so far I've been looking at MSM's, 6 speed NB's and the S2000, however I have seen some NC's in my aria and price range. What made you go for the NC over the competition? Congrats on your new whip.